KCI Rotary Supports Platte County Efforts! 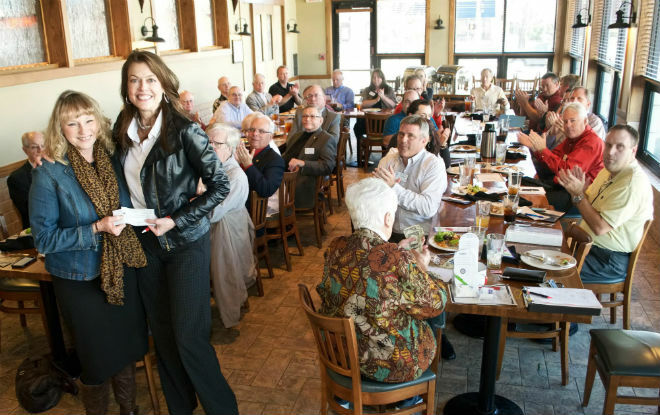 The KCI Rotary Club recently presented $5,000 to support two Platte County efforts helping families and children in need. At a weekly meeting Nov. 9, President Donice Mahan presented two checks to Mary Jo Vernon. Vernon is director of the Platte County Health Department, which coordinates a countywide Back to School program and the Day of Hope. Both programs provide necessities and supplies for needy families and children in Platte County. The school program helps children get ready for school each year by ensuring they have the necessary supplies. The Day of Hope provides necessities and other items for needy families before the holidays. Now in its fifth year, the 2016 Day of Hope will be Dec. 3.